On June13th, 2012 FCER recieved 6 horses from the New Mexico Livestock Board after they were called in by the Albuquerque Police Dept. 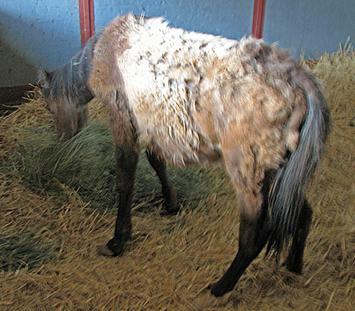 APD had responded to a burgerly in progress call and instead of burglers they found 6 severely emaciated horses behind the used car lot/ parts store. Although FCER was assured that charges would be filed, they were not. The owners did surrender the horses to FCER. The youngest is only a 4 months old.